as the sugar crystals are very small,i didn't use powdered sugar.u can use powdered sugar.if u don't have cantaloupe seeds,can use pumpkin or watermelon seeds. Chop Badam,Cashewnuts and Pista in the chopper or crush them into small pieces. Cut the dried apricots into small pieces of raisins size. In 1 tsp ghee,please roast the dryfruits for 2 minutes to make them crispy. Dry-roast wheat flour till the aroma comes out and the colour changes to badami colour. While hot itself,Stir well till it mixes thoroughly. Make round stiff balls when hot. 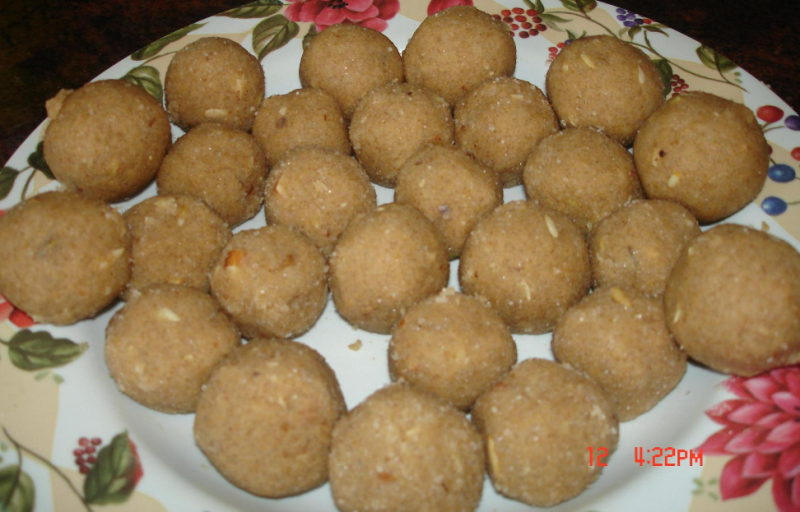 Wheat flour Ladoo is ready.